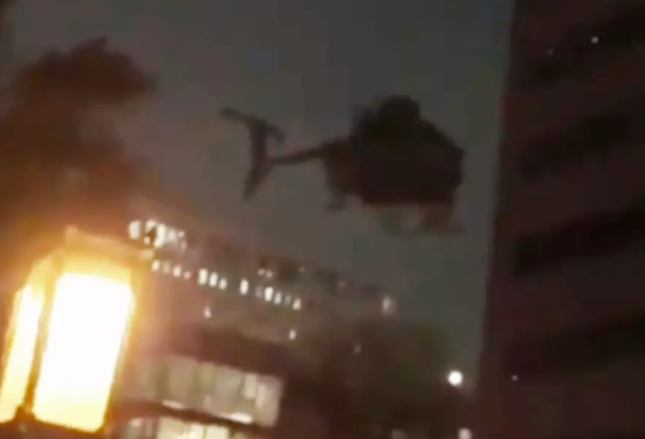 Army Helicopters Troll DownTown L.A! Ah yes, What does it feel like being so thin skinned that the sight of mere helicopters sends you into a panic! Ok, so they aren’t just any mere helicopters they are operated by some of the most badass aviators in the military. The 160TH SOAR! But after a training mission which we’re going to assume was to practice flight operations in an urban environment the people of Los Angeles California, despite a press release from the Army and various notifications sent to the LAPD and citizens, are again losing their minds after seeing something scary and black even though it is a key factor in protecting the liberties and freedoms they enjoy. Sound Familiar? Various air-frames were used during the Exercise most notably MH60 blackhawks and MH6 little birds. Quite honestly if you pay attention to the flying and formations it really is impressive just how good these pilots really are. For those of you that don’t know The 160th SOAR, featured prominently in the film Black Hawk Down, consists of the Army’s best-qualified aviators, crew chiefs, and support soldiers. Officers volunteer while enlisted soldiers volunteer or are assigned by the U.S. Army Human Resources Command. Until 2013, only men were allowed to be pilots in the 160th. Upon joining the 160th, all soldiers are assigned to “Green Platoon”, in which they receive intensive training in “advanced methods of the five basic combat skills: first responder, land navigation, combatives, weapons and teamwork”. Soldiers who fail to pass the course a first time may retake it, but there is no guarantee that anyone assigned to Green Platoon will pass and continue on with the 160th. The basic Night Stalker course for enlisted soldiers lasts five weeks; the officer course lasts 20 to 28 weeks. A new Night Stalker arrives to a unit Basic Mission Qualified (BMQ). After a series of skills test qualifications, experience, leadership, and oral review boards lasting up to three years, the Night Stalker is designated Fully Mission Qualified (FMQ). After three to five years as an FMQ, the Night Stalker may try out for flight lead qualification. The 160th SOAR specializes in night flying at low altitude for clandestine insertions into denied areas. Their pilots are highly proficient at NVG low altitude flying. The aircraft our outfitted with specialized secure communications and sensors which can account for the insane number of Antennae and vision systems that cover the helos. There are many theories flying around (No pun intended) the internet with many concerned they are preparing for everything from a mass casualty event, terrorists attack, or our personal favorite the invasion of Venezuela. They need practice for an Venezuela invasion. Want to believe; but very strange; more like a rehearsal for Martial Law. Consider DT’s threat of declaring National Emerg; only one step away from…. Either way if you are a U.S. Citizen in the United States logic would dictate there isn’t any reason to fear the Night Stalkers. That is of course unless you are a high value target trying to hide in plain sight. If thats the case be sure to wear your tinfoil hat. At least this guy gets it! Conceal Carry permit holder Shoots at traffic stop suspect! Venezuelan Military Releases Video to Intimidate U.S. Marines. Fails!